In this study, the “G-tox” active recovery method proved superior to the commonly use dangling-arm shakeout during a 2-minutes mid-climb rest. Using the G-tox recovery method facilitated faster clearance of blood lactate and other metabolic byproducts. After a 2-minute recovery period, climbers using the dangling-arm recovery method experienced a 2% gain (recovery) in hang grip strength, while climbers using the G-tox experienced an 18% increase in grip strength. This study looks at the physiology of rock climbing and more specifically recovery strategies for such activity. The human body was not designed to withstand the high amounts of resistance that the fingers and forearms commonly experience in rock climbing. Over time, sport specific training adaptations have allowed us to climb at increasing levels of difficulty. In recent years, there has been a growing interest in the sport of rock climbing. Since the early 1970’s, the grading system has been slowly expanding, as new measures of difficulty have been set. “Climbing is no longer just a recreation; it has developed into a true sport”, Sagar (2001:p1).Advances in equipment design and technology have helped increase performance, yet there has been relatively little research carried out on the physiology of difficult climbing compared with other sports. It is clear climbing performance is limited by physical fatigue. Fatigue can be defined as the inability to produce the required force and is a major factor of falling in rock climbing, (Vollestad, Sejerstad & Saugen 1997). Fatigue related falls in rock climbing often lead to frustration and even injury. Rock climbers, like runners perform in both aerobic and anaerobic conditions, using combinations of energy systems to overcome the differing terrain encountered, (Kascenska, Dewitt and Roberts, 1992). At high workload intensities, by-products of anaerobic glycolysis such as lactic acid (La+) can greatly reduce performance, especially in the sport of rock climbing where the ability to exert maximum forces with the fingers and forearms is greatly reduced, (Watts and Drobish, 1998). High accumulations of blood lactate (BL) concentration has been correlated to high performance whilst difficult rock climbing, (Booth, Marino, Hill and Gwinn, 1999). It was also suggested that repeated high intensity contractions will deteriorate handgrip strength and endurance (Watts, Newbury and Sulentic, 1996). Goddard and Neumann (1993) suggest that BL values of 6mmoll-1 and above can impair an athlete’s coordination, which could contribute to failure whilst climbing. Climbers who attempt routes near their maximum physical limit use high expenditures of energy and are required to exert high forces with the upper body and fingers. Such forces at high repetition can restrict blood flow (BF) to the fingers and forearms due to smooth muscle causing vasoconstriction (Goddard and Neumann 1991). This is dependent on the intensity of contraction; if capillaries are closed, anaerobic glycolysis struggles to supply blood and clear away waste products. It is vital that climbers should seek to improve recovery at limited rests they encounter on route. Sagar (2001) defines recovery as the body’s ability to diminish the physiological effects of fatigue. Hard traditional rock climbing and competitive sport climbing call for more active awareness of the body’s physical state, due to the higher stakes involved in falling. Rest techniques such as knee jamming, body jamming, bridging, arm barring and heel hooking offer ‘no hands rests’ or a reduction in intensity on difficult terrain. Understanding the human body’s ability to recover whilst rock climbing is vitally important, (Florine, 1990). Recovery in rock climbing can be broken down into short-term recovery, medium-term recovery and long-term recovery, (Hörst 2004, p137). Climbers are greatly challenged to recover in the short term, due to the sustained intensity of exercise and scarcity of rest positions. Short term recovery is widely expressed as taking place from 10 seconds to 30 minutes following completion of muscular activity, (Hörst 2004, p138). In the context of sport climbing, this time could take place at the top of a cliff post-climb, mid-climb at a stance that will allow temporary rest or between falls/attempts whilst red-pointing a route. There are times when a climber really does need to recover if ‘pumped’, for example, the climber could be attempting to onsight a hard traditional route with poor protection. Taking a fall in such circumstances can be daunting which is why it is important to maximise recovery. Hörst (2001) promotes the G-tox shakeout to accelerate short-term recovery. 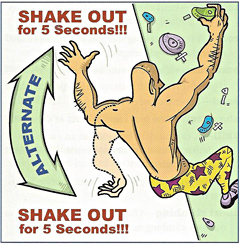 G-tox shakeout is an adapted version of the widely used ‘dangling arm’ standard shakeout (SS), where the climber alternates the arm over the head and below the waist. This technique claims to increase BF by allowing gravity to accelerate venous return; although the technique has not been scientifically tested, many climbers are experiencing the benefits. Note that the downward arm position is the arm position for the SS. Research by Watts, Daggett, Gallagher and Wilkins (1999) determined that low intensity active recovery (AR) reduces accumulated blood lactate within 20 minutes following difficult climbing. Recumbent cycling was used for active recovery. The results indicated active recovery as more superior than passive recovery (PR); unfortunately no handgrip (HG) data was collected during this study. Work by Watts, Newbury and Sulentic (1996) have researched into the degree of fatigue and time-course of recovery with sustained difficult sport climbing to the point of a fall. Watts et al (1996) found that handgrip strength (HGS) decreased by 22% and handgrip endurance (HGE) decreased by 57% from pre-climb to post climb for a group of 11 male climbers (ability: 5.12a-5.13d). Failure to maintain hand contact in difficult climbing is a primary cause of falling. Forearm BF can be occluded to different rates depending on the intensity of contraction. Modern rock climbers have gained physical adaptations through dedicated practice and training. A study by Ferguson and Brown, (1997) noted that trained climbers may possess an advanced forearm vasodilatory capacity allowing them to make repeated sustained contractions and sustain optimal blood flow. In addition to muscular strength and endurance gains, neuromuscular adaptations have been gained through an effective training stimulus, (Gresham, 2002). Improving short-term recovery strategies and learning physiological impacts of such strategies may help climbers avoid injury. The topic of recovery during rock climbing has received little research attention. This study intends to investigate whether or not the G-tox technique does accelerate forearm recovery. Strategies that accelerate recovery, increase climbers’ chances of succeeding on routes near their maximum ability, as repeated attempts are often required. In addition, accelerating recovery may lead to decreased chances of injuries. This study will hopefully enhance our awareness of the effects of g-tox recovery technique in difficult climbing. Economic movement and optimal climbing technique will limit the magnitude of fatigue in the first place. However, climbing efficiently will aid in lowering the intensity of muscular contraction and the total time under load. Hörst (2003). To explain Hörst’s statement, climbing efficiently will have increasing control over muscle fibre recruitment and limit over recruitment which in turn decreases the use of ATP. In addition, Goddard et al (1993) identify pace as an important factor to consider in difficult climbing. The speed at which a climber moves over difficult terrain can have a great effect on performance and decrease muscle fatigue. In simple terms, the shorter the length of time muscles are contracted to execute moves, the lesser energy expended. Warming up the body for physical activity is vital, especially in rock climbing where the upper body is subjected to high forces. A gradual pyramidal progression in intensity of contraction warms up the forearm muscles and finger flexors in preparation for maximum intensity climbing. The ‘flash pump’ is experienced when climbing in cold conditions or when the climber doesn’t warm up sufficiently (cold muscles). Recovering from a ‘flash pump’ takes much longer and can diminish performance and recovery capability for the entire session/day. The act of warming up and stretching relevant muscles increases blood flow and affects blood viscosity and muscle perfusion. The recovery instinct (Goddard et al.,1991,p89) can be explained as a climber’s/athlete’s intuitive self-awareness of the recovery capability of their body. Hörst (2003) describes factors such as depletion of muscle fuel cells, accumulation of metabolic by-products and low blood glucose levels as primary causes for fatigue in Rock climbing. If a climber is struggling to maintain contact with the holds whilst trying to recover/shakeout on a route, it is a situation of diminishing returns and the climber may as well have climbed on through the rest position and continued to the top or to a more efficient rest. Hörst (2003) characterizes recovery for rock climbing into 3 categories: Recharge, refuel and rebuild defined as Short term, Medium term and Long term respectively. The common dangling arm shakeout used by many climbers to alleviate exerted forearms and muscular cramps has not been scientifically tested. For this technique, arms are alternately shaken below the waist for brief periods in order to alleviate forearm tension, the benefits of this technique are dependant on the quality of the rest position if any recovery is to be achieved. Although no study has looked into the effects of this technique on forearm recovery, it could be suggested that this method does possess some advantages due to the high number of climbers who already use the technique to recover. Blood pooling and visible vascularisation in the forearms has been noticed when using this method of recovery. The G-tox recovery acceleration technique, suggests alternating arm positions between over the head and below the waistline to increase venous return and blood flow aiding active muscles. Although this technique has never been subject to research, according to Hörst, the simple practice of this technique provides a marked increase in recovery. This is proposed due to the increase in venous return and an increase blood flow to fatigued muscles, whereas, the traditional shakeout only offers a reduction in intensity for a brief period. Other actions that climbers practice to reduce tension in the forearms include stretching the forearm and rapidly opening and closing fingers. Both are widely practiced by climbers worldwide. Connective breathing, deep muscle relaxation and meditation are some other strategies climbers perform to increase performance pre-climb or on-route. The effects of self massage for recovery purposes have received no research attention in rock climbing. Monedero and Donne (2000) studied the effects of PR, AR, massage and a combination of the latter with AR on 18 trained male cyclists following 5km maximal effort tests. It was found combined recovery was the most effective protocol for maintaining maximal performance time. Performance nutrition supplements are commonly used at medium term or long term recovery periods. Creatine, Sodium bicarbonate, lactic acid buffers, electrolyte drinks and energy products are common place amongst highly active climbers. It is widely accepted that immediate ingestion of carbohydrates post session/day aids recovery by refueling glycogen stores. On sustained endurance routes, which require repeated high intensity contractions increases the need to momentarily alleviate build up of metabolic by-products such as lactic acid by increasing BF to the forearms. Medium term recovery can be from thirty minutes to twenty-four hours rest. This important recovery period may be overnight between climbing days, as it is crucial time to refuel glycogen and blood glucose stores. Long term recovery can be regarded as the period were muscle growth and neuromuscular adaptation takes place, usually from one to four days depending on the severity of delayed on-set muscle soreness and micro-trauma, Hörst (2001). Rest is important to allow muscular damage to be repaired and to rebuild the muscle to a stronger level before the exercise stimulus. This process of muscle repair and subsequent increased strength gain is called Super-compensation, Hörst (2001). The method section will follow, outlining experimental design and statistical analysis implemented in the study into the effects of g-tox recovery. To restate the purpose of this study, the aim was to look at the effects of the G-tox technique upon forearm recovery in rock climbing. BL concentration and HGS were the key variables that were monitored throughout the climbing control and the two different recovery controls, passive and active (G-tox). The subjects in this study represented an intermediate ability of sport rock climbers. Janot, Steffen, Porcari and Maher (2000) reported HR data for 10 beginner climbers and 17 recreational sport climbers during climbing and recovery. Mean HR values for the recreational climbers (mean peak HR 146bpm) were similar to that of the groups in the current study (mean peak HR 152 bpm). Anthropometric data and HR values were similar to that reported by Mermier et al., (1997) for a group of experienced climbers, with slight differences in BF% and age. The climbing time of 3 minutes used in the current study was close to a mean climbing time of 2.57+ 0.41 min, reported by Watts et al., (2000). Great effort was made to select well matched control groups using years of climbing experience as the main indicator to separate the subjects. However, it is evident from results that subjects possessed a wide range of fitness levels. This is indicated by the differing rates of La+ production and clearance amongst individuals in both groups. In addition, some subjects demonstrated experience of advanced footwork technique, using higher numbers of intermediatory footholds, which may have aided in lowering the intensity of the traverse. Video observation could have been used to make comparisons between variables such as pace, technique and style. The difference between the two recovery groups in terms of BL concentration reduction at the time of post-recovery in P1 was 55.8%. Conversely, BL results for post-climb BL levels indicate that only 5 (Group A: 3,Group B: 2) subjects reached BL levels of 4 mmol-1 and above after P1 climb. Heck et al., (1985) indicate the AT as being approximately 4 mmol-1. The exact same 5 subjects displayed higher levels of BL post P2 climb. Indicating that these subjects were unable to recover as they experienced ongoing accumulation of by-products during recovery and climbing. This agrees with hypotheses made by Goddard et al., (1991) and McKardle et al., (1997) in chapter 2. However, subjects participating in G-tox (P2) recovery experienced gains in HGS although they possessed BL values higher than 4 mmol-1. Dodd (1984) states performing recovery exercise above the LT offers no added benefit and may even prolong recovery by increasing La+ formation and adding to La+ accumulation. It would appear that reductions of BL concentration were not possible when values were higher than 4 mmol-1; suggesting G-tox is more effective at removing lower accumulations of La+. This improvement in HGS may have been made possible by the reduction of forearm muscular recruitment and an increase in venous return during recovery. Although several studies (Watts et al., 1999, Mondrero et al., 2000 and Jemni et al., 2003) have documented the effects of AR and PR during high intensity exercises, the effects of milder intensity arm movement during G-tox are still unclear. Results suggest that G-tox facilitates blood shunting away from the forearms towards the heart on the upward arm movement. Increases in HR at the start of P1 & P2 recovery for group B (G-tox) indicate increased BF circulation. It is suggested that the upward arm movement provides a ‘draining’ period for 5 seconds before dropping the arm to the down position for five seconds allowing fresh BF to ‘flush’ into the forearms. Due to accumulation of metabolic by-products being localised in forearm muscles whilst climbing, it would be attractive to hypothesise that mild upper body movement acts faster at reducing the effects of forearm fatigue as opposed to a running or cycling recovery protocol. Due to the lower amounts of La+ accumulation in rock climbing compared with cycling or running. Low intensity activity for recovery is preferred, as high intensity recovery will result in an increased imbalance between BL production and clearance rates, (McKardle et al., 1999). It could be implied that a lower intensity activity carried out with the upper body in climbing, serves just as well as a shuttle run in sports which predominantly use leg muscles. As stated in the method, hand-holds were varied in order to simulate a wide range of HG postures and the recovery stance designed to allow an adequate reduction in climbing intensity. All values display that the recovery stance provided an adequate decrease in intensity to allow some recovery, proving the amount of rest possible on certain holds is determined by the amount of reduction in muscular recruitment capable, (Goddard et al., 1991). Results speculate that the act of raising and lowering the resting arm every 5 seconds (G-tox technique) whilst recovering, significantly contributes to improvements in (MVC) HGS. Group A experienced a 2% increase in HGS over the 2 minute recovery, suggesting that the common dangling arm shakeout does provide some marginal increase in HGS. This poor improvement experienced by group A may have been caused by blood pooling in the forearms due to lesser frequency of arm movements, (Mckardle et al., 1997). Compared to group B, recovery using G-tox increased HGS by 18.4% during the same amount of time. Some researchers, myself included, have doubted the validity of HG dynamometers as indicators of HG performance for rock climbing. It would appear that the HG dynamometer used in this study (Takkei) was more specific to one kind of HG posture in climbing e.g. pinch. Most hand postures involve a typical isometric contraction against the hold, whereas the dynamometry required a squeezing (eccentric) contraction. Pre-climb HRs for subjects in this study ranged from 63bpm to 121bpm, with a mean pre-climb HR of 91bpm. Studies by Hardy & Martindale (1982) suggested that increased psychological arousal experienced in preparation for the climbing task was a factor for elevated pre-climb HR values. This change in pre-climb HR (Fig 13) prepares the body for physical exertion, but could be a limitation if HR is very high at pre-climb recording. Time-keeping whilst performing the G-tox technique controlled the frequency of arm movement. Although detailed recovery instructions were given to both groups, it is possible that some subjects performed the technique at differing paces. This could have resulted in HR and BF differences. A metronome could have been used to ensure identically timed arm movements between subjects. Further analysis of HR data could determine individual anaerobic thresholds using the heart-rate deflection point (HRDP) to indicate the moments of OBLA. This curve will show whether or not subjects entered the aerobic/anaerobic transition zone during the field test. Results show there was a large difference between P1 and P2 HGS and BL values for both groups. This may have been a result of insufficient rest between climbs or an imbalance of individual fitness levels amongst groups. Low hydration levels, poor technique whilst climbing and low blood glucose levels could also be key contributors. Fig 4 shows recovery groups elicited a different degree of response to BL concentration when performing the opposite recovery protocol. This change in the rate of BL clearance is indicated by a less acute curve in the BL line graph for both groups. In other disciplines of climbing such as bouldering, recovery from attempts is often spent spotting other climbers. Ironically, the nature of spotting closely replicates upper body movement present in the g-tox technique as the arms are periodically placed over the head. It seems that the subject of blood flow is an important factor in rock climbing. However, no studies have looked into the effects of Aspirin or Viagra upon blood flow during climbing. This would be an interesting area of research, as Aspirin reduces the volume of blood plasma increasing BF and could affect performance whilst rock climbing. Similarly, Creatine, Sodium Bicarbonate and Taurine have received little research in the context of rock climbing. It is concluded that performing the g-tox technique during recovery from rock climbing does accelerate forearm recovery in comparison to the traditional dangling arm shake-out. However, it must be expressed once more that the intensity of the recovery position is the key factor determining the recovery potential.